PLANET in PERIL, your "one-stop shop" for the truth about our planetary crisis. : More alarm bells sound over drug usage in the world's intensive livestock operations. Will Manitoba listen? More alarm bells sound over drug usage in the world's intensive livestock operations. Will Manitoba listen? by Larry Powell writes from SHOAL LAKE, MANITOBA. The World Health Organization is ramping up its warnings about the health risks of giving antibiotics to animals raised in intensive livestock operations (ILOs) everywhere. • Stop giving antibiotics to food animals altogether if it’s just to speed their growth - or prevent disease. • Don’t give them to healthy animals unless disease has already been diagnosed in another part of the same herd. • Cut back on the amount of antibiotics given to animals for any reason. As the world's appetite for meat keeps going up, so too do the volumes of medications which producers either inject or feed to their animals. This overuse happens in humans, too. But, in many countries the WHO does not name, about 80% of these medications are applied to food animals - mostly to fatten them up for market! “The new recommendations aim to help preserve the effectiveness of antibiotics that are important for human medicine by reducing their unnecessary use in animals,” states the WHO news release. “A lack of effective antibiotics is as serious a security threat as a sudden and deadly disease outbreak,” says the WHO’s Director-General, Dr Tedros Adhanom Ghebreyesus. He concludes,“Strong, sustained action across all sectors is vital if we are to turn back the tide and keep the world safe." Such steps are needed, warns the WHO, ominously, since “There are very few promising options in the research pipeline. The WHO claims its recommendations are based on "consistent evidence;" showing the effectiveness of antibiotic reductions. The agency believes this can also be achieved with little or no negative impact on animal health, welfare or production costs. "Many countries have successfully achieved complete restriction of growth promotion... demonstrating the feasibility of this recommendation." The overuse of antibiotics leads to “antimicrobial resistance” (AMR), where traditional medicines are no longer effective. WHO figures show almost half-a-million people around the world come down with tuberculosis that is resistant to several drug formulations each year. While TB is said to claim five thousand lives yearly, just how many of those would be attributable to AMR, is not immediately clear. But it is also known that AMR is complicating the fight against HIV, malaria, cancer chemotherapy, caesarean sections and even hip replacements. Canada does not keep statistics on AMRs. But, as long as ten years ago, a story in the Globe and Mail estimated that 8,000 Canadians were dying yearly due to to hospital infections which were difficult or impossible to treat. The giving of antibiotics to food animals (completely legal in Canada) is also believed to be widespread in this country, although the extent of it is hard to get a grip on. So I e-mailed “Manitoba Pork,” to see if they'd comment, both on on the amount of antibiotics they use and on the WHO recommendations. I haven't heard back, so far. 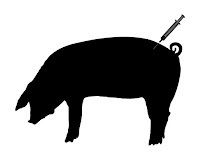 And, any day now, the Government of Manitoba will introduce legislation which will pave the way for a major expansion of hog “ILOs” in this province. Very unlikely, for it is no secret that the Pallister government is very involved in supporting and playing "patty Cake"with the Manitoba Pork Council (MPC) and the factory hog producers . Welcome to Manitoba…The Manure Pile of modern civilization!